I decided to try something new in 2012 and give myself a focus word (think Ali Edwards and her one little word) - I chose FAITH, in the sense both of a trust and confidence in myself and my religious beliefs. So I embraced 2012 with a new found faith. I returned to my local church parish and asked for help in my journey towards renewing my faith. Not only did I find the RCIA program (Rite of Christian Initiation for Adults) but I was welcomed by so many kind parishoners and other curious people on the same journey as me. We have a long way to go as we travel toward Lent and our sacraments, but we are on this path together and we are making steadfast progress. Like so many mums, mothers and carers I have struggled with trying hard to do it all. I know now after trying unsucessfully to be everything to everyone that I need help. I have relinquished some of my obsessive/control mamma behaviour and accepted the love, help and support that my husband always had offered. I'll admit it was hard, but I have put more faith in Scott than I have before. No, he doesn't hang the washing out like I do - but it still gets dry. Maybe the childrens' lunchboxes are not quite as balanced as I would make - but the kids don't go hungry. And Yes, I sometimes I still struggle with the new dynamics of our household - but I'm dealing with it and love my husband all the more for what he does for us. I have also put my faith in my skills. 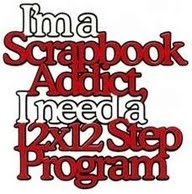 As much as I love to scrapbook for myself, I so desperately wanted to put my work on the line and try to get onto a design team. This is such a giant leap of faith for me, submitting my work -which is oh so personal- to criticism and scrutiny. So I applied, and was rejected, and rejected again, and still I applied. Success! Finally a scrap team that wanted me on board. 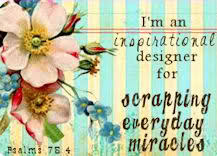 Funnily enough, with my focus on Faith, the blog that offered me a design team position was Scrapping Everyday Miracles. Is that just luck or divine intervention? I do wonder. Sure, there are many other aspects of my life where I could renew my faith. The list is limitless to be honest, but I am working on it. At least I know that what I set out to achieve this year I have put my all into and made some progress. Where will 2013 take me? I haven't decided on my focus yet, but have some ideas floating around in my head. Have a wonderful evening ringing in the New Year. May 2013 bring you all health, happiness and prosperity. What a truly beautiful and calm piece of creation Felicity! I am in awe!! Use it Tuesday... Ink it up!